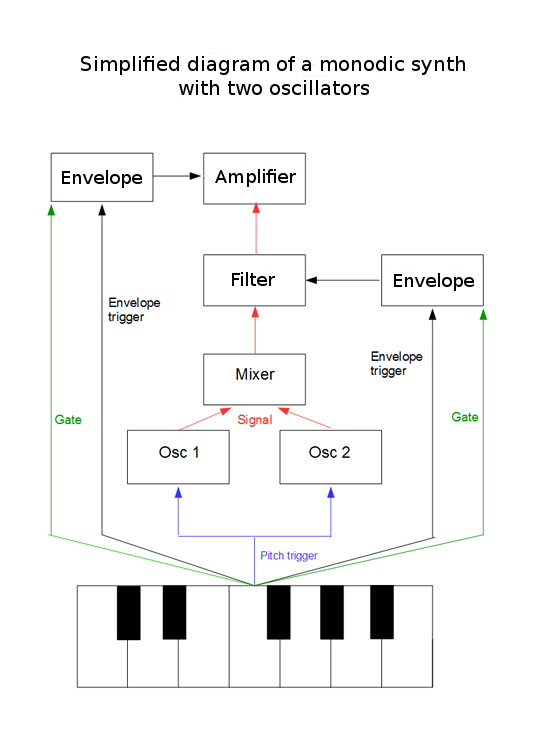 In the previous articles we saw what makes up a synthesizer's basic sound chain: Oscillators, followed by filters and an amplifier, plus envelopes to control them. We also saw that an oscillator can produce a sound wave, with more or less harmonics, but always based (as long as it's a periodic wave) on a fundamental sound, whose frequency can, in many cases, correspond to any of the notes of the western music system. But what happens when we want to play several notes at the same time, a chord, for example? Or several sounds of different natures? We'll try to answer these two questions in the current and the following article. First of all, we need clearly differentiate the notions of poly and monophony..... oops, sorry, I meant "monody." Indeed, that's the correct term, even if nowadays almost everybody falls into the error of using "monophony" in this context. 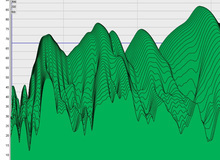 Monophony is the contrary to stereophony and it makes reference to the number of channels of an audio playback system. Thus, it has nothing to do with today's topic, which is the number of notes that can be played simultaneously on an instrument. The confusion is nevertheless understandable since the opposite of monody is not "polydy" ─ a word I just invented ─ but rather polyphony. Oh, yes, language can be tricky. Now, returning to the subject at hand, you may be tempted to simplify everything by stating that monody means there is only one oscillator and polyphony that there is more than one. And that would be to miss the point completely! Because the difference between monody and polyphony doesn't have to do with the number of oscillators, but rather with the number of voices. So, before going any further, it's important to define what a "voice" is. 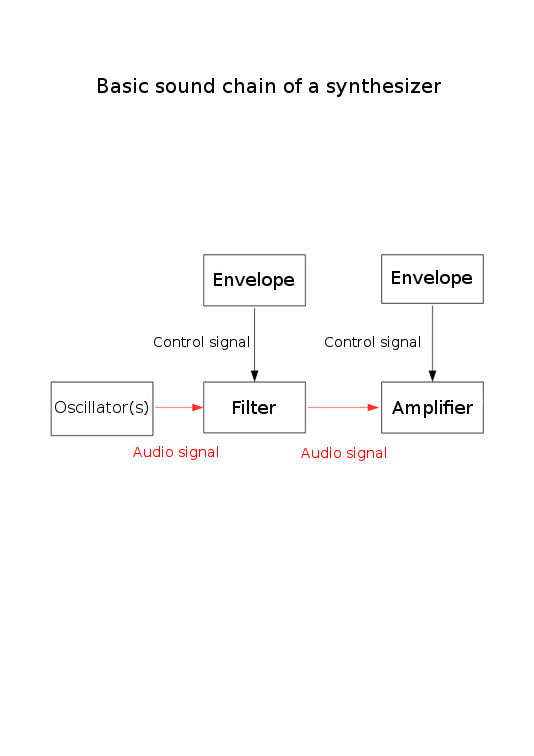 The basic sound chain we noted in the introduction of the article ─ oscillators, filter and amplifier, with the respective envelopes ─ could be considered as a voice. But it's much more than that! When you engage a key of a synth, you activate three other elements simultaneously: A "pitch trigger" (also called "pitch CV," which stands for pitch control voltage) that informs the device of the key you pressed, an "envelope trigger" that activates the different envelopes concerned, and a "gate," which remains "open" as long as the key is depressed and, thus, serves to indicate the system when the key is released. As you can see, a "voice" is made up of lots of other elements, not just a simple oscillator. By the way, let's briefly return to the definition we gave above: "Oscillators, filter...", wait a moment, was that "oscillators" in plural? For one single voice? Yes, most synths offer several oscillators per voice in order to produce richer sounds. For example, Moog's recent Little Phatty monodic synth provides two oscillators, capable of simultaneously producing a different waveform each and even to be out of tune between them, without that making it a polyphonic synth, since both oscillators are triggered by one single key, and their signal is processed by the same chain of elements (filter, amplifier, envelopes, etc.). The fact that this synth can produce, at the same time, two sounds of different nature makes it a multi-timbral synth (a term that also refers to a synth that can play multiple parts simultaneously on different MIDI channels). Monody means playing one single note or voice at a time (even if, as we just saw, the latter can include different sounds!). But then, what happens when a musician plays a wonderful eighth-note chord, or when he or she simply makes one note cling on to the next one while performing a melodic line? How does a monodic device define which of all the simultaneously pressed notes ought to be played? When such a situation presents itself, a priority system steps in to determine which one, from all the notes pressed, is to be preserved. The main options available, depending on the synth, are the following: Priority is given to the lowest note (which is the most common option), the highest note, the last note or, very occasionally, the first note. Back in the '70s, American and Japanese synths differed, among other things, in the note priority used: American synths gave priority to the lowest note and Japanese synths did the same with the highest note, which entailed different playing techniques to make melodic transitions between notes. Being aware of such specificities and mastering the playing technique associated with each of them could prove to be very interesting when performing melodic riffs.